Over time, daily activities and unprotected sunlight exposure damage the thin skin on the hands. These damages like unsightly age spots, wrinkles, dryness and creepiness make people look older than they actually are. 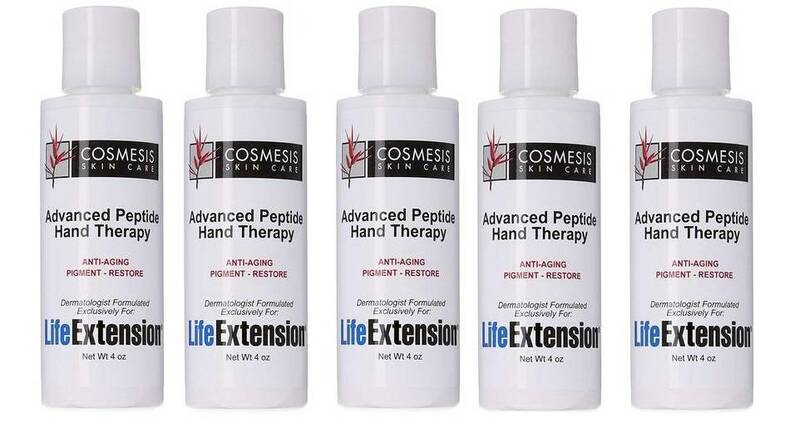 Cosmesis Advanced Peptide Hand Therapy is a new formulation containing six natural compounds that help rejuvenate the appearance of aging hands. The formulation lights the dark spots, minimizes the crepe-like look of wrinkles, hydrates the skin and corrects the skin tone. N-Acetyl Glucosamine and Retinol - Aging-increased pigment production causes several skin discolorations like age spots, discolored patches, and uneven skin tone. Pigment production is slowed down by n-acetyl glucosamine. It was clinically shown that the compound evens out skin tone and softens brown spots in just eight weeks. Retinol, which is a form of vitamin A, supports skin health after sun exposure. Sarsasapogenin and Macelignan - With age, hands lose subcutaneous fat, which causes a skeletal-like appearance and increases the visibility of tendons and veins. The plant compound sarsasapogenin increases factors involved in fat cell (adipocyte) differentiation by 201%. Due to this process, the formation of subcutaneous adipose tissue and plumping of the skin are supported. The nutmeg compound macelignan was shown to increase lipid storage within adipocytes. This indicates support for plumping of the skin and minimizing wrinkles. Macadamia Oil - Aging hands are commonly flaky and dry. Macadamia oil is among the richest sources of palmitoleic acid – a key component of sebum that supports hydration – and thereby able to moisturize and soften dry, mature skin. Macadamia oil also provides the natural moisturizers squalene and vitamin E.
Acetyl Octapeptide-3 - Years of hand muscle contractions leads to wrinkles. The neuronal excitability behind these muscle contractions can be moderated by acetyl octapeptide-3 which has been shown to result in a reduction of wrinkle depth up to 63%. Cosmesis Advanced Peptide Hand Therapy includes all six of these compounds into one synergistic formula. Our product noticeably rejuvenates the appearance of aging hands. Purified Water (Aqua), Hydrogenated Polyisobutene, Anemmarrhenae Asphodeloides (Root) Extract, Glycerin, Cyclopentasiloxane, Dimethicone, Macadamia Ternifolia Seed Oil, White Oil, Polysorbate 20, Cellulose Gum, Acrylates/C10-30 Alkyl Acrylate Cross-Polymer, L-Arginine Ethyl Ester Dihydrochloride, Macelignan, Tocopherol, Acetyl Octapeptide-3, Retinol, Glucosamine, Phenoxyethanol, Ethylhexylglycerin. Apply once or twice daily to back of hands.